Just got this jpeg of S.M. 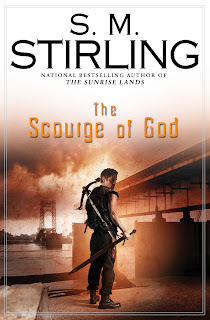 Stirling's new cover. This book takes place in Steve's post-Change world and reunites the reader with the MacKenzies, the Bearkillers, the Protectorate, and a whole host of new groups and cultures. I've read it. If you like the series, you'll like this one. While in the first series, Steve took readers from science fiction to epic fantasy, in this series he takes them from epic fantasy into the age of legends. A very interesting project to watch develop, I have to say. The email that Steve sent this in had, as a auto-generated footer that was right over the image, "Start the year off right. Easy ways to stay in shape in the new year."